The 2018 FIFA World Cup Final was the last match to determine the winner of the 2018 FIFA World Cup. This was the 21st final of the FIFA World Cup, a tournament played by the men's national football teams and organised by FIFA. The match was played at the Luzhniki Stadium in Moscow, Russia, on 15 July 2018, between France and Croatia. 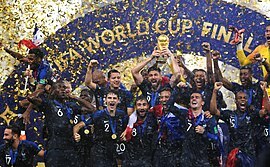 France won the match 4–2. Mario Mandžukić's own goal at the 19th minute was the first World Cup final to have an own goal. The winners of the World Cup qualified for the 2021 FIFA Confederations Cup. ↑ 2.0 2.1 2.2 2.3 "Match report – Final – France v Croatia" (PDF). FIFA. 15 July 2018. Retrieved 15 July 2018. ↑ "FIFA World Cup Russia 2018 – Match Schedule" (PDF). FIFA.com. 20 December 2017. Retrieved 20 December 2017. ↑ "Mandzukic makes World Cup history with own goal against France in Russia 2018 final". Goal.com. Retrieved 15 July 2018. 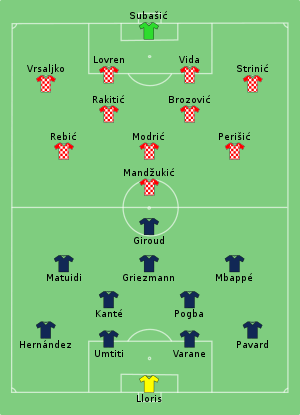 ↑ 6.0 6.1 6.2 "Tactical Line-up – Final – France v Croatia" (PDF). FIFA.com. Fédération Internationale de Football Association. 15 July 2018. Retrieved 15 July 2018. ↑ "Match report: Half-time – Final – France v Croatia" (PDF). FIFA.com. Fédération Internationale de Football Association. 15 July 2018. Retrieved 15 July 2018. This page was last changed on 22 November 2018, at 02:37.